This cloth-bound volume was edited by Ed Schwartzreich and published as a limited edition of only 160 copies (90 of these are minus page numbers - see note below) by ImageRe: Digital Works in 2008. ISBN 978-0-9816850-0-7. 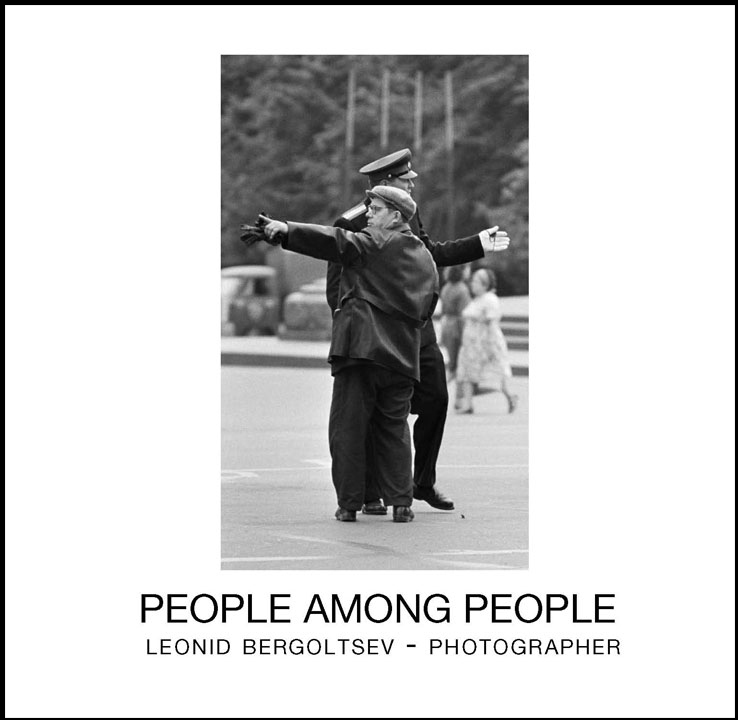 The book is a collection of 174 photographs by Leonid Bergoltsev. The photographs are titled and the photographer has provided unique descriptions of many of the instants he captured. Some of the people among people are well known: Van Cliburn performing in the former Soviet Union; a pensive John Steinbeck; Mikhail Gorbachov, Yevgeniy Yevtushenko, Lev Landau; Boris Yeltsyn; various cosmonauts; Marshal Busyonniy; Averell Harriman, Harrison Salisbury; Marian Anderson; King Mohamed Zahir Shakh of Afganistan; Simone Signoret; Pope John-Paul, for example. Many other of the "people" are men, women and children from around the world. These photographs, unique in perspective and mood, have evoked strong emotional responses from nearly everyone who has previewed the work. The book has two introductions. One is by Jack F Matlock Jr.. former Ambassador to the USSR, and the other is by photographer and litterateur, Yuri Krivonosov, who has known Leonid for most of his professional life. Of very special interest is a Memoir written by Leonid Bergoltsev (an exerpt is given below). "This volume presents to American readers the work of one of the best Russian photographers of the Soviet period, who has preserved for us precious insights into the people, society, and politics of the second half of the twentieth century. But it is not only a remarkable collection of photojournalism from the recent past; it also contains many images of high artistic quality that stand on their own as esthetic creations." Jack F. Matlock, Jr.
"During my almost forty years of life as an active photographer, I happened, as any photo-journalist, to have worked in a variety of conditions: on the earth, under the earth, on the sea and in the air. Mostly, in Russia, in the former Soviet Union. I visited several tens of countries in the Northern hemisphere, some of them multiple times. And of course, I never departed without a camera, or more precisely cameras. Sometimes, five or even six of them were hanging on me: different films, different objectives. I especially liked taking pictures of people who didn’t see me and were themselves. A human being’s psychology is such that when he sees an objective pointed at him, willingly or not, he starts to pose, i.e. tries to look, as it seems to him, better. That’s when he changes; he is no longer the same as he is in reality, but the one who he tries to be. He wouldn’t interest me as a photographer by that time. In this book, I collected only those black and white pictures that I like myself. There are many different people - from ordinary passers-by to chiefs of states, from street merchants to the Pope - but thankfully few are the ones who posed." The price in the US is $95 US ($85 + $10 shipping and handling). The check should be payable to Judith Kitchell and it should be accompanied by the downloadable PDF order form. Please contact us ( by email (juliekitchell@imagere.com) or phone/fax (802-244-4906) or by snail mail (ImageRe: Digital Works, 57 Dog Ridge Dr., Waterbury, VT 05676) for payment options and shipping costs for orders from outside the USA.